Combine butter and garlic, spread on rolls and toast in the oven until brown. Heat oil in a 2 quart saucepan until 360 degrees. Mix creole seasoning and flour. Dredge shrimp in flour then egg; roll in panko. Fry shrimp in batches until golden brown. Spread remoulade sauce on all 4 rolls. Top with shrimp, followed by shredded lettuce. Remoulade sauce: Mix mayo, horseradish, pickle relish, minced garlic, cayenne pepper, and ponzu in a bowl. 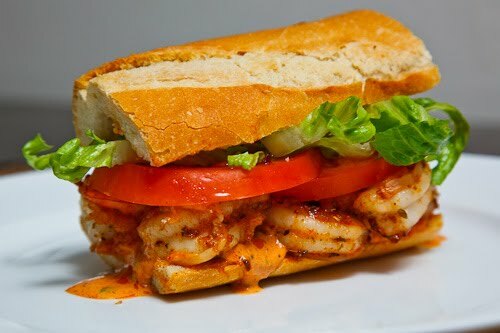 No comments for: "Shrimp Po' Boys Recipes"